Owned by Oakland Raider Legend, Art Thoms, this vacation rental offers easy access to Highway 50 and is perfect for families and even large groups. This 2300 square foot home is situated on a private cul-de-sac and is only steps away from the second hole of the beautiful South Lake Tahoe Golf Course. From the large sun deck, complete with patio furniture, you can gaze at the beautiful tree covered mountains and admire the beautiful golf course. This tri-level house comfortably sleeps 12 in three bedrooms and a loft. The master bedroom has its own walk-in closet, full bath, and sliding glass door with access to the sun deck. There are large couches, plenty of blankets and pillows, outdoor charcoal grill, two fireplaces, and horse shoe pit. 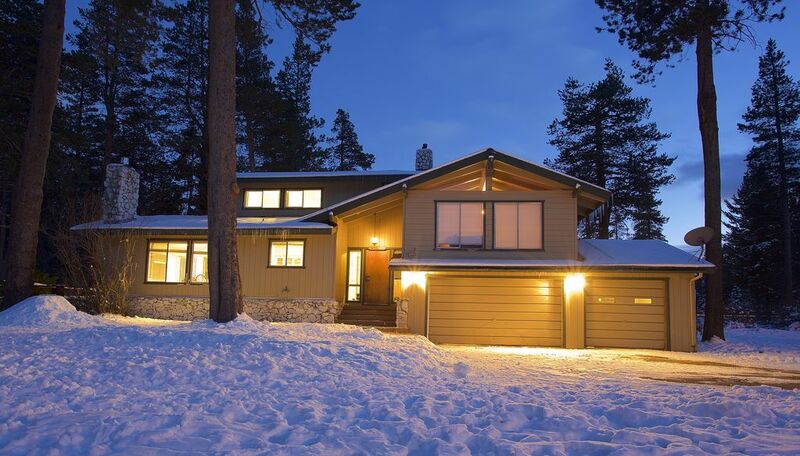 Winter Activities: The house is a short 15 minute drive from all major South Lake Tahoe Ski Resorts (Heavenly, Sierra-at-Tahoe, and Kirkwood) and Casinos (Harvey's, Monte Bleu, Harah's, and the Hard Rock). Also, snowmobiling and snow parks for sledding are only minutes away. House also has a instant hot water heater, which means no matter how many guests come home from skiiing there will be hot water for everyone for as long as needed. Summer Activities: Lake Tahoe offer endless water activities. We are within walking distance of the Upper Truckee River, which runs throughout the golf course. Also, nearby are the amazing Horse Tail Falls. We are members of the South Lake Tahoe Association (located in the community off E. San Bernadino Ave) which offers a recreational club house, including a private lake, waiting pool, tennis courts, video games, rafting, play structures, etc. Other activities: fishing, hiking, water-skiing, shopping, boating, golfing (Edgewood, South Lake Tahoe Golf Course, etc.) miniature golf, the best Fourth of July fireworks anywhere, and much more. The Fresh Air, Beauty and Relaxation found in the Area of South Lake Tahoe cannot be replicated anywhere else. Located in a quiet neighborhood on a quiet cul-de-sac. There is plenty of space from our neighbor to have your own fun and privacy. Close enough to visit the casinos, but far enough not be bothered by them. See the second green, third tee box, and fifth tee box from the living room. Regular drip coffee make and Keurig coffee maker. Card decks, uno and several other board games. Xbox 360 and Playstation 2. On Deck area. No smoking inside the house!!! This place looks a lot better in the pictures. Overall, it feels rundown. There was no shampoo, soap, dish rags, grill scraper, or propane. We spent half our day trying to track them down. The hot tub was dirty and was broken. We tried contacting the owner but he didn’t seem to eager to fix it so we ended up googling how to fix it ourselves. The washing machine was broken and only allowed us to wash hot water loads. One washing machine still had a load of towels in it so we couldn’t even use that one. We didn’t feel safe with the garage doors not even locking- a big safety issue! There were some nice features. Lots of space for big families and a few nice upgrades, but we weren’t very happy with our experience. The house is newly painted. Most of the rooms have been updated. We were very comfortable. Nathan was very responsive. Properly was located in a great area. House was little worn. Kitchen sink sprung a leak . Could use some new paint, some beds were a little thin and lumpy. Hot tub was great. Golf course nearby was a plus. Was a really nice layout, great for families with kids. Kitchen and bathrooms were very modern. Had a great time there. Lots of tvs, jacuzzi on the deck was great. Kids had a great time with lots of things to do. A little far from town and outside trim of the house could use some attention. Otherwise a really nice house and would recommend it. The house had plenty of room. The kitchen is beautiful, good for cooking and entertaining.